DALLAS, Dec 9, 2011/ FW/ — For the beauty enthusiast on your list, the newly minted Red Carpet Manicure is the perfect stocking stuffer. 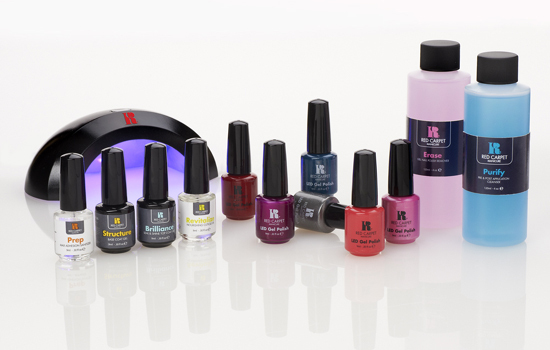 Launched nationwide last September at ULTA, Red Carpet Manicure is an LED gel polish manicure and pedicure system that brings the professional salon experience to the masses with a simple and effective at-home application that is ready within minutes. A new category in the consumer beauty industry, Red Carpet’s gel nail polish is the first of its kind in the retail market. Available in 36 shades, one treatment lasts for weeks with a fast, safe and easy application that guarantees a professional salon manicure with no chipping or peeling. The Red Carpet gel manicure and pedicure are applied in three simple steps: preparation, care & color, and finish. The system includes an exclusive Portable LED light or a Pro:45 LED light that cures the gel polish in seconds for weeks of wear. Red Carpet Manicure, LLC is also consulting with celebrity nail professionals to develop patented color shades and tap into the current nail trends in the industry. Red Carpet Manicure creates an affordable gel nail polish option with the full system costing $57.94, or just $2.90 each for twenty at-home applications compared to an average of $40.00 for each professional application in the salon.